today I’ve decided to go with jeans. If you are regular reader you’ll know I’m a huge fan of jeans- especially my skinny jeans- but sometimes I want something a little looser. Introducing the ‘sort of’ skinny jeans. These are similar to my Madewell Skinnys, but not quite as tight. They are a perfect alternative to anyone who is not ready for the super tight skinnys. The straight leg is still slimming, but they don’t look painted on. Since my sweater doesn’t cover my bum- this is important! I’ve paired them with a simple brown sweater. On the right I have on mom jeans and a buttoned up cardigan and tennis shoes. This look just sort of seems blah. I wouldn’t look twice at me! On the left I’ve re-worked it by switching out the matronly cardigan for this cute sweater with these fun sleeves and detailed pattern. I’ve also added a necklace and replaced the tennis shoes with these cute leopard flats. My goal isn’t too look like I just came off the runway, my goal is to look like someone who has put a little effort into her look- and I think this does. This sweater is much more interesting than the boring cardigan. By the way, I’ve started a Facebook page, if you’re interested, click here! Feb 8th, Ain’t No Mom Jeans! I really like this because it looks achievable to me! I’m almost always wearing jeans and a sweater of some sort. 🙂 Where do you get your fun necklaces? I want one like this! This is Stella and Dot. Isn’t it gorgeous?! To see more, click on the link in my post! I have a pair of almost skinny Lauren Conrad jeans from Kohls (super cheap) and they’re similar, skinny enough but not a painted on. signed: cold feet in Mass. lol. I know what you mean. I only wear my ballet flats when I know I’m going to be inside most of the day. My feet are always cold too! 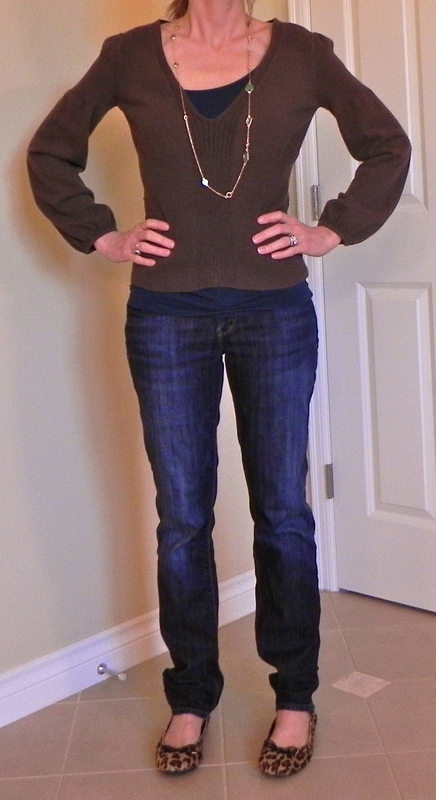 I am really loving my booties- they are a great alternative to knee high boots, and I can wear socks with them. I love Smart Wool socks- they are so warm (I get them at Nordstrom). I have 2 pairs of booties- one from Khol’s (tan) and the other from DSW (black). The black are far more comfy- and they were very reasonably priced. They do have a heel, but since it’s a wedge it is actually comfy. The other option is the loafer- they are everywhere right now, and I suppose you can wear them with socks, right? I’ve also seen gals wearing motorcycle style boots (ankle height). That isn’t my style- but it’s an option.